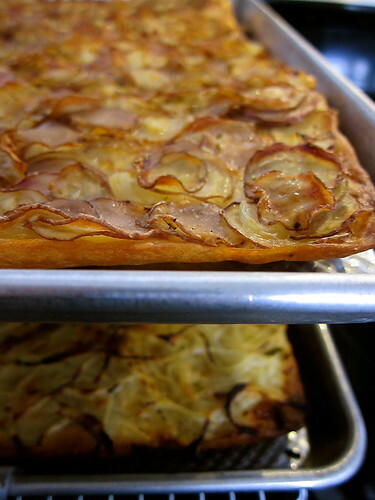 We were reminded of how good potatoes on pizza can be during a recent dinner at Flatbread. 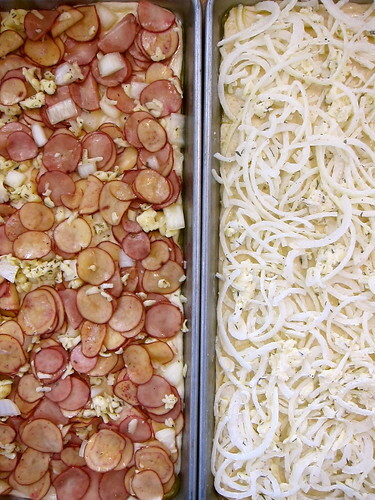 Featuring fingerlings from Meadow’s Mirth, our pizza was one of two specials showcasing local ingredients that night. 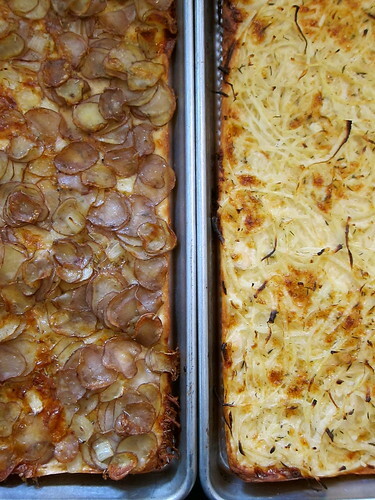 Rather than being stodgy, the potatoes lent a nutty earthiness, and provided a lovely contrast to the other toppings. This is also the time of year we take stock of what’s left in the root cellar — mostly potatoes and onions at this point. Using a recipe from Jim Lahey’s My Bread as a base, these two flatbreads elevate these root vegetables from the everyday. The recipe makes two flatbreads, each topped differently. The fingerlings were left skin-on and sliced thinly, then left to soak in salted water to soften and quicken cooking. Straight out of the oven and still crispy around the edges, it’s rather like a potato chip pizza. In addition to the herbs, we like to toss in a some grated cheese. In this instance, we used local cheddar; other good choices are fontina, Gruyere, provolone or even a smoked gouda. It’s easy to improvise with these flatbreads, however, try to keep a light hand when adding more to the toppings, or the dough will bake up soggy. While similar to Lahey’s No-Knead Bread, the dough requires only a 2-hour rise and can be made the same day it’s to be used. Once it’s doubled, the dough will seem a scant amount to cover two 13 x 18 inch sheet pans — this video guides in the stretching of the dough. – Combine flour, yeast, salt, and sugar in a bowl. Add the water and, using a wooden spoon or your hand, mix until blended, at least 30 seconds. Cover the bowl and let sit at room temperature until the dough has more than doubled, about 2 hours. – Generously oil two 13 x 18 inch rimmed baking sheets. Divide the dough into two equal-sized pieces, and place one in each pan. Gently stretch the dough across the surface of the pan, pressing it evenly out to the edges. The oil will help keep the dough from sticking, and will be absorbed during baking, adding flavor. – Heat the oven to 500°F. Top dough with choice of toppings, making it sure it’s spread evenly to the outer edges; this will help protect the ends from browning too quickly. Bake for 25 to 30 minutes, until the crust is pulling away from the sides of the pan. Serve the flatbread hot or at room temperature. – In a bowl, combine water and salt, stirring until salt is dissolved. Slice the potatoes thinly (1/16 inch thick), and place slices directly into salted water to prevent oxidation and from turning brown. Let soak in the brine 1½ hours (or refrigerate for up to 12 hours), until the slices are wilted. – Drain the potatoes and pat dry. Toss the potato slices with the onion, grated cheese, pepper, rosemary, and olive oil. Makes enough topping for one 13 x 18 inch flatbread. – Slice the onion thinly (⅛ inch thick), for about 3 cups sliced onion. In a bowl, toss the onion slices with the remaining ingredients. Makes enough topping for one 13 x 18 inch flatbread. Adapted from “My Bread” by Jim Lahey; submitted to YeastSpotting. Local ingredients: Potatoes from Hollister Family Farm and Meadow’s Mirth; onions from Black Kettle Farm; cheddar cheese from Brookford Farm; herbs from the garden. 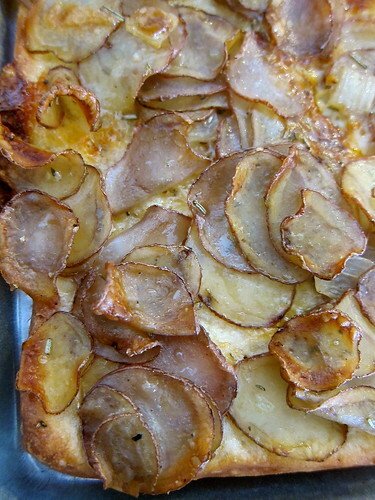 This entry was posted in cooking and tagged alliums, baking, herbs, potatoes. Bookmark the permalink. 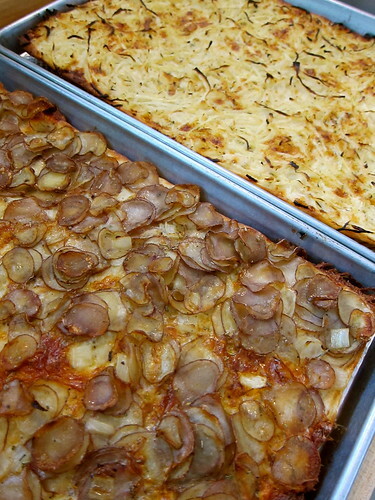 My old Sicilian landlord in CT made potato pizza. His was double crusted with the potato, cheese and onion filling inside. It looks absolutely delicious. Reminds me of Otto’s in Portland where they have wonderful vegetable toppings. Oh my! Both pizzas look awesome. I have to make the potato chips pizza for my nephew. Great recipe! I don’t know which one I would choose, maybe the onion one. I have a soft spot for the smell of onion coming from the oven, probably because traditionally it comes from a pot or skillet on the stove. I have never had onions paired with cheese.